The Padstow Peninsular has everything for couples: from romantic cliff-top walks to evenings in Rick Stein’s restaurant and quaint Cornish pubs. And for short-breaks there’s no need to drive to Cornwall! We’re just 15 minutes from Newquay Airport with 3 low-cost London flights every day year round, plus flights to Manchester, Glasgow, Norwich, Edinburgh, Newcastle, Belfast and East Midlands. For sports lovers there is golf, surfing (see our special discounts) or cycling on the nearby Camel Trail. The beach isn’t just for families, outside school holidays our nearby beaches are tranquil and idyllic. There is no better opportunity to try surfing or other watersports (see our special discounts). For walkers the South West Coastal Path offers unspoilt views of the Atlantic coast. Padstow is a treasure. Nestled on the banks of the Camel Estuary, its fishing harbour is one of the only sheltered spots on the rugged North Coast. Well known for seafood chef Rick Stein(who has a restaurant, cafe and pub), this stretch of the North Coast has become Cornwall’s gastronomic capital, including Paul Ainsworth’s No 6, and Jamie Oliver’s Fifteen at Watergate Bay, alongside our local favourites. Cornwall has an outstanding cultural heritage. 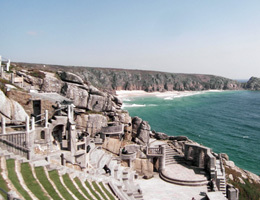 Its unique scenery has given rise to a vibrant artistic community: from small landscape galleries to our own Tate Gallery at St. Ives. Cornwall has inspired many authors: from the villages of the nearby Camel Estuary that John Betjeman was so fond of, to the windswept moors and creeks which inspired Daphne Du Maurier’s Jamaica Inn and Frenchman’s Creek. 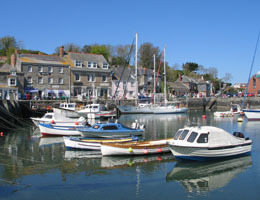 Check availability and book your self catering holiday accommodation in Harlyn Bay, Cornwall. A collection of Cornish stone holiday cottages and one luxury modern house located close to the sandy beach at Harlyn Bay, near Padstow in Cornwall.